Welcome to Yorozuya! An applause for our third running year as the biggest Gintama fanclub on MyAnimeList. Since we're talking about Gintama, everything is possible and discussable. The story starts with Sakata Gintoki who is a samurai living in an era where samurais are no longer needed. To add to his troubles, oppressive aliens have moved in to invade. Gintoki lives with Kagura and Shinpachi, taking on odd jobs to make the world a better place...and to pay their rent. With Gintama as our main objective, we claimed the name of Yorozuya as odd jobs come here everywhere. Meet Gintama and it's fans from all over the world! 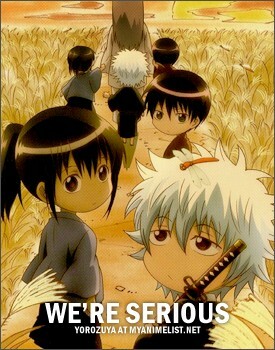 There is a bunch of freaks around here but don't worry, we're talking about a Gintama club. Just go with the flow and join the game! What is written on Shinpachi's idol fanclub coat? @Mikadoh https://discord.gg/rKtZq3f go to #select_your_roles and do !Otaku , you can select other roles if you like! There is an anime area you can chat with others, might even inspire others to watch Gintama. and hope you enjoy discord all are welcome.